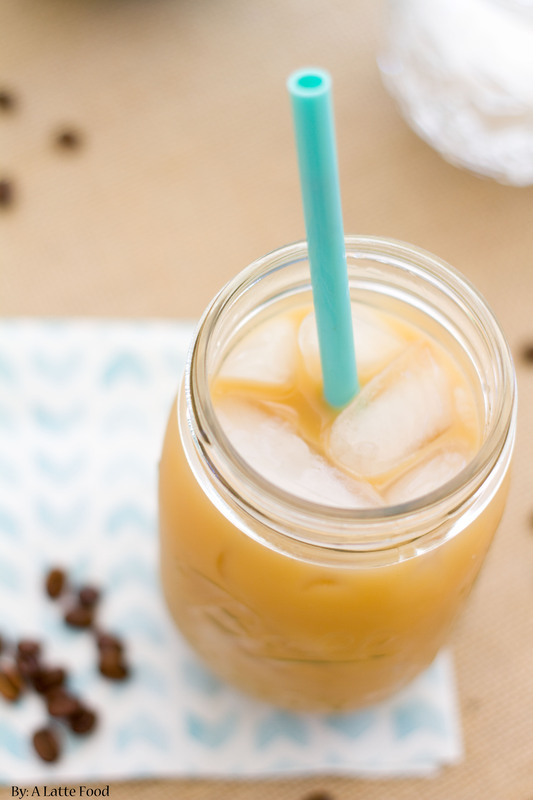 Homemade Iced Coffee: For the coffee lovers out there, this homemade iced coffee recipe is absolutely delicious, simple to make, and easy to customize. Homemade cold brew coffee has never been easier! In case you haven’t noticed, I’m a bit of a coffee fanatic. In fact, I used to detest coffee. Back in the good ‘ole days of braces and gangly limbs, aka jr. high, I had a couple of friends who drank coffee every. single. morning. To this day, I still find that a little weird (what 13 year old starts the morning off with a cup of black coffee??? My friends, apparently). However, whenever I spent the night, they’d always offer me a cup, and I’d take it, trying not to outwardly cringe with each sip. But then I grew to love frappuccinos, which let’s face it, isn’t really coffee at all, but I’m pretty sure it was the gateway to my obsession. (Probably because frappuccinos meant Lemon Cakes, Pumpkin Coffee Cake, and Blueberry Cream Cheese Scones…that is until Starbs started giving all of us heart attacks with the calorie counts). In college, I grew to love lattes, and mochas, and cappuccinos. Soon that led to me loving the black stuff with just a bit of sweetened creamer in it. Now, apart from straight black coffee, I love it all, especially the Iced Coffee. When I was in New York, I tried about a dozen different coffee places (okay, okay, maybe just more like 5 or 6). When it comes to iced coffee, I realized that I actually really like black coffee with a splash of milk. Part of that, though, is because I tried really, really good coffee places that know how to roast their beans and brew them perfectly. I’m not a coffee snob, but for the record, I am picky about how my coffee tastes. At first, I was pretty hesitant to try an iced coffee without vanilla in it and only with milk and sugar. But it was delicious. I tried different coffees at different places, but the two coffee places that I grabbed an iced coffee at were The Bees Knees in the West Village and Ninth Street Espresso over by Central Park. If you’re ever in the area, give those places a whirl. Breakfast of champions right there. That delicious breakfast sandwich came from Bread Street Factory Cafe over near Central Park. Let me tell you, that place during the morning dash does not appreciate the line being held up by a non-local who had to sign for her credit card. Back to the coffee, this recipe is adapted from The Pioneer Woman’s recipe. In the past, whenever I’ve made iced coffee, I’ve brewed hot coffee, waited for it to reach room temp, popped it in the fridge, then drank it. This recipe, if you think about doing it the night before, is far easier. And tastes better too, I might add. It starts with 6 cups of water, 4 oz of ground coffee, and a night in the fridge. After that, with a sieve and cheesecloth (or paper towels) you drain the grounds from the coffee. Iced Coffee all day long. For the coffee lovers out there, this homemade iced coffee recipe is absolutely delicious, simple to make, and easy to customize. Homemade cold brew coffee has never been easier! In a large container or pitcher, mix water with coffee grounds. Allow to sit in the fridge (or on the counter) for 12 hours. Once the coffee has steeped, place a sieve over a pitcher. Lay the cheesecloth or paper towels over the sieve (the coffee grounds usually manage to find their way into the coffee if you only use a sieve) and pour the coffee through the sieve and paper towels. Throw away the grounds and enjoy your perfectly delicious iced cup of coffee! I would never have thought to leave the coffee in the water overnight! Thanks for the tip 🙂 I’m going to make a big pitcher of this for a brunch I’m having this weekend! love iced coffee! craving some right now!